Tokyo: September 1st, 1923 — A cataclysmic earthquake rocks the foundation of Japanese political and social life. Tremors, shocks, and a cloud of fire that engulfs the city kill thousands; many more are butchered by reactionary mobs lashing out against resident foreigners, the working poor, and political dissidents. Weeks later as the bedlam subsides and the city slowly recovers its composure the bodies of Ito Noe, Ōsugi Sakae, and their six-year old nephew, Tachibana Munekazu, are discovered, naked but wrapped in tatami mats, in an abandoned well. Government authorities launch an investigation into their deaths, quickly bringing a young lieutenant to trial. Though Ito, Ōsugi, and certainly Tachibana were innocent of any crime, they were arrested and murdered by a government gang without trial in the Great Kanto Earthquake’s chaotic aftermath. Implausibly, only two men were ever held responsible for the killings: the lieutenant, Amakasu Masahiko, and his subordinate, Kamoshida. Later known as the Amakasu Incident, the murder of these three can help to foreground an analysis of state repression more broadly. Thomas A. Stanley, whose biography of Ōsugi is one of the only book-length sources in English on the life of Japan’s preeminent anarchist activist and the only one to cover his final years, encourages us to see Ōsugi’s death as “but a footnote to the period’s history because it makes no statement about the political system or the government.” We should take issue with this precise interpretation; for while it is the case that the murder is marked by the personal agentive action of Amakasu and his accomplices—and thus singular and unrepeatable—this particular incident is a signal of larger trends in Japanese politics. The Amakasu Incident was a sign of the times. International news agencies reported on the case, the subsequent trials and retributive actions had severe repercussions for Japanese political culture, and it is revealing of the workings of a systemic repression of Japan’s anarchists, radicals, and marginalized population. Stanley concedes that there is circumstantial evidence pointing to a bureaucratic conspiracy to murder Ōsugi, though he points out that there is no concrete evidence implicating anyone higher up that Amakasu. We will present the case for this conspiracy, but we suggest that this sort of conspiracy theory is perhaps beside the point. In the words of Adrienne Carey-Hurley, maybe we should see Ōsugi’s murder as state-facilitated if not state-sanctioned. This perspective requires us to consider the systemic forms of repression active in Japanese society at the time. Our historiographical understanding of Japan between the enactment of the (Meiji) Constitution of the Empire of Japan in 1890 and the various political phases and imperial reigns that shaped Japan until the end of the Pacific War shows many great and fundamental changes. Yet, it is only infrequently that the continuities between the political thrust of the Meiji Constitution and the totalitarianism of the early Shōwa Japan (1926-1945) are highlighted. A modest contribution to this latter project, in this essay we will argue that a critical analysis of the Amakasu Incident suggests that totalitarianism was not necessarily the negation of democracy in Japan, but, in terms of repression of dissent, it was a continuation of processes initiated by the construction of a modern democratic state and furthered by Taishō party politics. Before unpacking these claims, it is worthwhile to review the circumstances of the Amakasu Incident of September 1923. At the time of writing, Japan and the world are reeling from the effects of the 9.0 Tōhoku earthquake, which struck northeast Japan on March 11th, 2011. 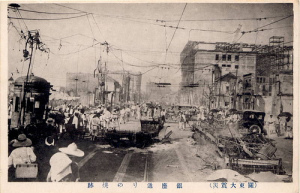 Yet, 78 years before the Tōhoku quake, another major earthquake shook the foundations of Tokyo, Yokohama, and Japanese political life in late 1923. On September 1st, 1923 the Great Kanto Earthquake rocked the region home to Tokyo and Yokohama. It was a catastrophic event, not only flattening thousands of homes with the initial force of the tremors, but also generating a tsunami, fissures, and deadly landslides. The most ghastly forces in this disaster were of human origin: the fires and terror. Unlike in 2011, in 1923 the majority of Japanese households were made of flammable material and meals were prepared in these wood houses using charcoal fires. The Kanto quake happened at 11:48 a.m., and as people were preparing lunch on small charcoal grills, their fires were upturned inside their homes. Flames spread across the city within hours. All in all, 187 major fires were reported, destroying over half a million homes and contributing to the initial 91,000 reported dead because of the tremors. Another 13,000 were reported missing and over 100,000 injured. Lines of communication throughout the region were disrupted and many panicked. In the midst of the disaster the anarchists, like everyone else, sought safety. Fearing for their loved ones and wishing to avoid the fires in the city, Ōsugi and Ito (both young parents; he was 38 and she 28), travel to the suburbs of Tokyo to visit family. They met Ōsugi’s 6 year old daughter, Mako, at the home of the anarchist poet Yasunari Jirō, though the little girl had been so terrified by the earthquake that she ran screaming down the street and had to be brought back to safety. They begin to look after Osugi’s nephew too, a boy born in Portland, Oregon and thus an American citizen (this fact would have consequence during Amakasu’s trial). But unlike many scared parents in Tokyo, the anarchists did not have the privilege of safety. Within days rumors had been circulating that anarchists and socialists had allied with malcontent Koreans and were looting and destroying the city in an opportunistic crime wave. Fearing the worst, on the day following the earthquake a “transcendent” (read: dictatorial) cabinet was set up to manage the crisis. Yamamoto Gonnohyōe, who had only been appointed Prime Minister on the day of the earthquake, tried to compensate for the government’s lack of preparation by overreacting to the disaster with severe force. He requested for the emperor to declare martial law in effect over the burning city. In charge of the besieged city they put a nationalist general named Fukuda Masatarō. Thousands of police including the notorious kempeitai, the military police, were deployed in tightly organized brigades. Their authoritarian rule over the affected city marked an acceleration of repression in Japanese political climate as the quake leveled and razed Tokyo and Yokohama to the ground. By September 3rd hundreds of anarchists, socialists, and syndicalists were imprisoned in Tokyo. Vigilante groups enforced martial “order” as well. These mobs reacted to paranoid rumors of socialist and Korean arson by hunting down and murdering thousands of people from these minority populations. The violence against Koreans was not only limited to Tokyo and Yokohama, but reportedly spread to Saitama prefecture. The reactionary breach of conduct influenced the authorities as well. Many police were undoubtedly complicit in the slaughter of Koreans, though the official government stand on the issue was that the vigilante groups exercise restraint. True, some of the vigilante murderers were themselves put to death by the police. Yet, at Kameido police station for example, about as many innocent labor leaders as murderers were executed in the week after the quake. Murder in a police station is a fate that may have befallen many anarchists who disappeared under mysterious circumstances. One particular activist was Yoshimura Otoya, one of the anarchists who received Ōsugi upon his return from Europe in May. The police systematically hunted down anarchists like Yoshimura, Ōsugi, and Ito. A dragnet was circulated with the names of all prominent socialists. One particularly rabid kempei officer, Amakasu Masahito, assumed the patriotic quest to eliminate the anarchists with uncommon zeal. Amakasu was particularly worried about “dangerous thoughts,” and decided to add the names of Ōsugi, Ito, and others to the dragnet that he then re-circulated. Amakasu was a trained genocide manager before the earthquake and he firmly held that anarchists, like Koreans and labor organizers, were populations deserving of suppression. He was, incidentally, like Ōsugi, a graduate of the Nagoya Cadet School, a military training institute. Yet, where Ōsugi, who was the son of a military officer, refused the violent nationalistic ideology forced upon young cadets, Amakasu made a career out of pursuing the state’s interest at all costs. It was on September 16th—a little over two weeks after the quake—that the two finally met. Ōsugi had only been back in Japan for two months before the earthquake. Earlier in the year he had been traveling around Europe on the invitation of anarchists in Berlin. He didn’t make it to Germany in time for the International Congress of Anarchists there, but his trip was still eventful. In France he attended a May Day rally in the north Parisian suburb of Saint-Denis and delivered a speech. This act gained him the attention of the authorities, who immediately apprehended him and over the next few months extradited him to Japan. Knowing that Ōsugi was recently returned, Amakasu prioritized the anarchist’s capture after the earthquake. He sent spies to track Ōsugi and his family down, and after finding them he intercepted and abducted the anarchists as they were en route to visit family. In the most detailed of the gruesome reports, we learn that after restraining them in chairs in separate cells, Amakasu apparently strangled the three at the Kameido police station himself. Amakasu went from cell to cell, first administering a swift strangulation to Ōsugi, then visiting Noe in her cell. Amakasu might even have been aware of Noe’s writings (in one essay she describes her ideal society as “having no need for police stations or police patrols”) because he immediately asked her if she thought that police were absurd. Before she could finish uttering a deflective response (“people have all sorts of opinions about all sorts of things”), Amakasu was on top of her, suffocating her words in his grip. The young Tachibana was killed last, undoubtedly mortified after overhearing the anguished deaths of his family. At his trial, Amakasu explained that he was motivated out of a sense of patriotism. This explanation may regrettably have earned him some leniency (Allen reports that thugs and criminals of the time were often given light sentences if they appealed to patriotic ends in their crimes), but the court still found him guilty and on Dec. 8th, 1923 he was sentenced to serve ten years in prison. Though Stanley and others fail to make this connection, it was apparent to Japanese anarchists of the time that larger forces were at play. In a document signed by “Anarchists of Tokyo,” and circulated in Esperanto to international radical circles, the state itself is indicted for conspiracy to murder the anarchists. In this document’s analysis, Amakasu is relegated to fall-man for a much deeper plot. The Anarchists of Tokyo are skeptical that Amakasu acted alone and was motivated by patriotism. Instead, they argue that he was an accomplice in a “systemic plot of the Japanese government” whereby the state not only sent in trained professionals to kill anarchists, but also provoked the vigilante mobs with stories of anarchist looters and arsons and permitted them to bear arms like swords, guns, and bamboo lances. As corroborating evidence they refer to the murder of 10 anarcho-syndicalists on September 3rd. In this incident, the secretary of a syndicalist union, K. Hirasana, and his comrades were abducted and brought to Kameido station. Making the best out of a bad situation, the labor organizers began to sing labor songs in their cells. Then, citing “Article 12 of the Garrison Regulations,” an obscure law that the prisoners had transgressed in some way, the police stabbed them to death with bayonets before burning their bodies along with hundreds of Koreans who had met similar fates. Hundreds more anarchists were detained in cramped jail cells, even more were effectively placed under house arrest by constant police surveillance of their homes. Actions like this cannot but speak for some organized campaign of repression, be it ad hoc or preordained. On the subject of the Amakasu Incident itself, the Anarchists of Tokyo inferred parts of their analysis from details made public during Amakasu’s trial. Amakasu’s defense was predicated on his patriotic motivation. The anarchists saw through this: “For if he undertook the crime thru[sic] his own designs, then he did not have to accompany Osugi to the official gendarmy[sic] quarters, nor did the government have to dismiss the commanders.” There were other incommensurable details; if Amakasu was truly proud of his patriotic action, and if his nationalist pride was not simply a show for the court, he wouldn’t have needed to hide his crime by disposing of the bodies. On top of it all, at his first court hearing Amakasu admitted that other kempei officers who administered the police stations near where the anarchists were staying tipped him off as to Ōsugi and Ito’s whereabouts. Allegedly they plotted to use the opportunity provided by martial law to kill Ōsugi. With so many contradictory analyses and so much misinformation it may be impossible to ascertain the truth (or untruth) of the conspiracy. But certain key details make it seem likely. For example, Amakasu, whose prison sentence was light to begin with, was released after serving only three years. He was even reinstated in the military and promoted to a position in the Japanese occupation of Manchuria. Further, the long and fraught history of state repression of anarchists in Japan should certainly be considered. Ōsugi’s comrades were aware of his personal battles with the law, as well as the chilling legacy of the High Treason Incident. Indeed, the so-called “winter years” (fuyu no jidai) of Japanese socialism were only barely thawing in 1923, to be followed by a near-eclipse of aboveground anarchism. The prelude to the winter years began in 1908, when Ōsugi and others were imprisoned for demonstrating with red flags and communist banners in celebration of the release of a comrade. Then, in the High Treason Case of 1910-11, twelve others, including Kōtoku Shūsui, the anarcho-feminist Kanno Sugako, and the Buddhist anarchist Uchiyama Gudō, were rounded up and executed for the unattempted conspiracy to assassinate the Meiji emperor. And at least in the case of Kotoku, this was a gross miscarriage of justice as subsequent evidence in the form of a secret letter from Kanno Sugako to a supporter vindicates Kotoku of involvement. But Kotoku was eliminated for his outspoken views, not for conspiracy to commit murder. Before his execution, the state tried to control all of his publications, which were deemed to spread “dangerous thoughts”. Copies of the anarchist Heimin shimbun magazine were confiscated and destroyed after he published a translation of Marx and Engels’ The Communist Manifesto. Other publications were banned, like Kotoku and Kanno’s journal ironically entitledJiyu shiso (Free thought). Like Kotoku, Osugi found that being Japan’s most prominent anarchist was a dangerous honor to hold. It took two years after his release from prison for Osugi to resume his anarchist publishing with any vigor, but once he began he would write and edit anarchist works continuously until his death the next decade. These included the anarchist periodicals Kindai shisō (Modern Thought), Heimin shimbun (Common People’s Daily), Bunmei hihyō (Critique of Civilization),Rōdō shimbun (Labor News), and Rōdō undo (Labor Movement). Without exception these publications could only be produced under secretive conditions and in the case of Kindai shisō and Rōdō undō production was halted and restarted multiple times because of state intervention. Throughout this, Ōsugi tried to avoid any direct confrontation with the law, though he was interrupted while speaking at a union rally in 1919 and arrested. As mentioned above, anarchists were not the only ones troubled by the repressive political climate. Though he was certainly no sympathizer with radicals, G. C. Allen, a British professor who lived in and wrote about Japan during the Taishō period, was appalled by the “extraordinary powers possessed by police.” Even “respectable” citizens, he wrote, were terrified of the sordid and indiscriminate control exercised by the “protectors of the people” who “became their tyrants.” Even during the period of democratic rule, the authorities wielded totalitarian command over daily life. They could censor any and all media; all public meetings had to receive their permission; they were in charge of inspecting businesses and homes; and they upheld “public morals” for the sake of the Emperor. Aside from the examples already listed, the repression of anarchism had consequences for anarchists as well as non-anarchists. In 1910, Akaba Hajime, author of an anti-capitalist pamphlet on rural communalism entitled “The Farmer’s Gospel”, was arrested for criticizing the emperor in passing. He died in prison after a prolonged hunger strike. Then, in 1920, a professor at Tokyo University named Tatsuo Morito was fired for publishing an article that described the thought of Peter Kropotkin, though his intent had been to criticize the anarchist’s ideas (the works of Kropotkin were prohibited). For less famous anarchists state policy made any sort of organizing extremely difficult. Anarchist and other dissenting ideals were labeled as prohibited by the Constitution of 1889. Predating this, the Japanese police system was reconstituted under control of the Home Ministry in 1874. The vision was to use the police as an instrument of mental and cultural control backed up by lethal force. A litany of repressive “Peace Preservation Laws” were put on the books, beginning in 1894 and furthered by the Public Order and Police Law of 1900, and a final Peace Preservation Law in 1925. Article 17 of the 1900 law affected the labor movement especially because it effectively outlawed collective action of any sort in the workplace. Then, following the High Treason Incident, it became commonplace for anarchists to be monitored by the police, who had the power to detain activists for questioning without cause or warrant. From [then] onward, the persecution of socialists had grown increasingly severe, and one comrade after another was thrown in jail. Every kind of freedom was constrained: of expression, of assembly, and of publication. They lost their jobs, were driven from their homes, ostracized by their friends and acquaintances, and were constantly made the objects of ridicule by ignorant newspaper reporters. The comrade who died forlornly in the C [Chiba] Prison without exchanging a single word of conversation with the guard! The comrade who, leaving prison, ventured to a new land only to go mad and kill himself! …all of our comrades had reached the limits of exhaustion…. Again, this is suggestive of systemic repression, but not proof of a conspiracy. Nevertheless, to outright deny the conspiracy would go against the grain of informed opinion of the time. The indictment of the state outlined by the Anarchists of Tokyo was shared widely. After Ōsugi’s murder, a comrade of his wrote “there must have been two or three thousand men in Japan who swore to take bloody revenge.” At the time of the murders, even nationalist commentators were dismayed at how the murders imply extraordinary military involvement. To contemporary readers, it is almost inconceivable that Time magazine, the epitome of mainstream, would defend the purity of an anarchist against the vile and detestable police, yet in its pages Amakasu is characterized as a nationalistic “firebrand” who sought military control over the country while Ōsugi is the pitied “internationally-minded prisoner.” We will return to the question of the political climate below, but first we’ll examine anarchist actions against the state in order to deepen the argument that the state was certainly and essentially antagonistic to the anarchists. Of the “two or three thousand” Japanese radicals mentioned above, some felt so strongly about it that they decided to take justice into their own hands. In Bumei hihyo, a journal that Ōsugi and Ito edited between 1917 and 1918, Ōsugi wrote: “After all, life is a revenge… To live is to revenge oneself constantly upon those who stand in the way of one’s own living and development.” Taking Osugi’s declaration that “life is a revenge” at its most prosaic level, some anarchist met the state injustice with similarly violent reprisals. One of the most prominent acts of violent revolt against the state happened later in the year when the details of the state repression were revealed. A young communist named Namba Daisuke (incidentally the son of a Diet member) retaliated to the state brutality by attempting to assassinate the emperor. He failed in his mission and was executed. In another abortive attempt to assault politics-as-usual, Wada Kyutaro assaulted General Fukuda Masataro, commander in charge of martial law in Tokyo, on the anniversary of Osugi’s death. Wada had loaded his pistol with one blank and five live rounds. He only fired the blank, the empty casing of which actually injured the general as it struck his left shoulder. The police apprehended Wada and then arrested seven other socialists includingRodo undo contributor and Red Flag Incident veteran Muraki Genjiro and “the terrorist with a big heart,” Daijiro Furuta, in connection with his plot. Wada received life imprisonment without parole for his mock crime, a stark contrast to Amakasu’s scant three years for a triple homicide. It would not make much sense for the anarchists to attack Fukuda unless they believed him to be in some way complicit with Amakasu’s crime. And the sheer number of attempts on his life is certainly telling of deeply held convictions on the anarchists’ part. Shortly after Wada’s feigned assassination, a letter bomb exploded in Fukuda’s home, though without injury. Despite Wada’s intentionally nonlethal first assault, he made it clear to the police that Fukuda would be made accountable for Ōsugi’s death. As with the letter bomb, more anarchists tried to make good on Wada’s threat. A third attempt on Fukuda was made at a restaurant in Tokyo on May 24th, 1925. An assailant fired a gun through a window, but the bullet missed its mark. The would-be assassin escaped on foot. The Guillotine Society, founded in 1922 by Tomioka Makoto (Tetsu Nakahama), Daijiro Furuta, Yamazaki Shojiro, and Muraki Genjiro would take up a campaign of political bombing for months after Ōsugi’s death, financed at least in part by a series of successful bank robberies. Five of them were sentenced to death in April 1925. Tomioka would be killed in 1926 for participating in a plot to kill Emperor Hirohito. Whatever the logistical impact of the bloodshed on the repressive system, we may never know; however it did not do much to help the anarchists win the battle for good publicity. (Though if they had actually succeeded in killing Emperor Hirohito the history of the entire twentieth century would be much different, likely for the better.) Certainly some were emboldened by the cavalier risks being taken in the name of freedom; but conversely, for most people these attentats confirmed the popular caricature of anarchists as violent idealists. Propaganda by the deed did not meet perfect results, and unfortunately reprisals from reactionaries were to follow as well. On Dec. 17th, 1923, the day of Ōsugi’s memorial service, three members of the Anti-Socialist League absconded with Ōsugi’s ashes from the office of an anarchist affinity group. According to reports, the three men arrived disguised as mourners who were going to pay respects to Ōsugi. But once they entered the room where his remains were kept one of them drew a pistol and began firing at attendees. In the commotion they made it to a getaway car with the ashes and sped away. Though there have been dramatic shifts—notably the American occupation and American-constructed new constitution of Japan—there are some continuities between the state forms of Taisho and present-day Japan. We see a record of protracted repression of dissidents. During the G8 Summit in Japan in 2008, ¥15.5 billion was budgeted for silencing protest. Activists were preemptively imprisoned and their residencies monitored. At the time of writing, the state is even pursuing a three year old case against three people who simply went on a “reality walking tour” to see where the social elite of Tokyo live. Observers on the left have occasionally pointed out how disaster, crisis, and unrest (anything from an earthquake to a major world summit) can be used by a power elite to its own advantage. At the risk of making a naïve transhistorical argument about power, we may even say that elites always try (try also being operative in this sentence) to make use of a disaster. Going further, some have argued that crisis is simply part of the normal operational procedure of statism and capitalism. By briefly comparing the deaths of the Koreans to those of the anarchists, we can identify separate processes, one of which underlines this analysis. It appears that the killing of Koreans was simply an unfortunate consequence of popular resentment—the state only abetted this bloodshed to the extent that it enabled mob rule. The Amakasu Incident, however, displays separate features. As Sonia Ryang puts it: “whereas Japanese socialists and anarchists were seen by the authorities as elements that needed to be eliminated, Koreans were seen as killable.” In this chapter we looked at how the state responded to exceptional circumstances. Far from being an isolated incident, in the Amakasu Incident we see the state at work repressing dissent and eliminating opposition, evidence that lends weight to an analysis of the state as an organ of repression. In the case of the Kanto earthquake, the exceptional circumstances provided a pretext for repression—the active pursuit of leftists and minorities, which was absent in the “normal” course of affairs. The implied question is: “how does a state legitimize itself if exceptional circumstances are present as part of the natural world?” If dictatorship can be justified within the framework of democratic politics, mustn’t we be actively questioning the state’s motives? Anarchists who pondered this question came to understand the normal course of affairs as being a state of constant warfare. As Foucault put it, “Repression is no more than the implementation, within a pseudopeace that is being undermined by a continuous war, of a perpetual relationship of force.” In Japan during the early twentieth century we see the pseudopeace fraying at the edges. But how did the pseudopeace not become completely undermined by the continuous war against dissent? Hegemonic power relations tend to have a protocol, with varying levels of formality, for ventilating rebellious heat. Foucault, describing functions of the state in the European context, focuses on how from the 17thcentury, “to police” began “to refer to the set of means by which the state’s forces can be increased while preserving the state in good order.” That is, policing is the active expansion of the status quo. Rather, the expansion of a certain status quo that is envisioned by the state. But where Foucault goes on to focus on how statistics and other forms of knowledge were used to police society, in Japan, the state, which adapted modern European statecraft to its own context during the Meiji Restoration, interpreted the role of police as being a proactive force of ideological and physical intervention. In this light, perhaps we can suggest that Japanese imperialism (and fascism in Europe) was the extension of repressive principles that are operative in a lesser degree under democracy. The murders that officially blemished General Amakasu’s record were not enough to actually prevent him from continuing to serve the state. Not long after his sentence was commuted he was stationed in the Japanese puppet-state of Manchuguo, where he gained further notoriety for managing the police forces in the new capital Changchun. He would later become the head of the Manchuguo Film Association, the Japanese empires propaganda organ in the pseudo-colony. There is even evidence that right-wing ultra-nationalists actually funded Amakasu in the bombing plot that would become known as the Mukden Incident. It’s sickly fitting that a genocidal zealot would be promoted to cultural director for Japanese imperialism. It can be written off as fascistic madness, temporary and historically removed from the present. However, it should be pointed out that military-political-cultural collusion of this sort is fairly common even in contemporary democratic countries. In one sense, we are done with General Amakasu. He committed suicide by swallowing a cyanide pill suicide in 1945 as Soviet forces pressed on the Manchurian border. Later that year the American-designed post-45 constitution abrogated the kempei. But in another sense, the nature of state repression has not changed so much since 1923. Figureheads and government policies may have changed (and these changes may arguably be an improvement), but as long as there is a repressive status quo maintained by force, there will be anarchists and anti-authoritarians fighting for a more just and free form of social relations. Allen, G. C. Japan: The Hungry Guest. New York: E. P. Dutton & Co., Inc., 1938. Crump, John. “The Anarchist Movement in Japan.” Anarchist Federation. 2008. http://www.afed.org.uk/ace/japan.html (accessed January 2011). D., R. Furuta, Daijiro. June 18, 2007. http://militants-anarchistes.info/spip.php?article1880&lang=fr (accessed March 2011). Filler, Stephen. “Chaos from Order: Anarchy and Anarchism in Modern Japanese Fiction, 1900-1930.” PhD diss., The Ohio State University, 2004. Foucault, Michel. Security, Territory, Population: Lectures at the Collège de France, 1977-78 . New York: Picador, 2009. —. Society Must Be Defended: Lectures at the Collège de France, 1975-76. New York: Picador, 2003. Garon, Sheldon. The State and Labor in Modern Japan. Berkeley: University of California Press, 1987. Hane, Mikiso. Reflections on the Way to the Gallows: Rebel Women in Prewar Japan. Berkeley: University of California Press, 1993. Jansen, Marius B. The Making of Modern Japan. Cambridge: Harvard University Press, 2002. Koschmann, J. Victor. Murder of an Anarchist Recalled: Suppression of News in the Wake of the 1923 Tokyo Earthquake. November 5, 2007. http://www.japanfocus.org/-The_Asahi_Shinbun_Cultural_Research_Center-/2569 (accessed February 2011). Libero International. “Bakunin and Japan.” September 1978. Ōsugi, Sakae. The Autobiography of Ōsugi Sakae. Translated by Byron K. Marshall. Berkeley: University of California Press, 1992. Reality Tour Support Campaign. “Suppression Report”. 2008. http://www42.atwiki.jp/asoudetekoiq/pages/535.html (accessed February 2011). Reischauer, Robert. Japan: Government—Politics . Vol. 1939. New York: Ronald Press. Ryang, Sonia. “The Tongue That Divided Life and Death. The 1923 Tokyo Earthquake and the Massacre of Koreans.” Japan Focus. September 3, 2007. http://japanfocus.org/-Sonia-Ryang/2513 (accessed March 2011). Saffell, John. “Japan’s Post-War Socialist Party.” The American Political Science Review 42, no. 5 (October 1, 1948): 957-969. Stanley, Thomas. Ōsugi Sakae, Anarchist in Taishō Japan: The Creativity of the Ego. Cambridge: Harvard University Press, 1982. Takeda, Yoshitaka. “Hidden for 100 Years: Kanno’s Secret Message from Prison.” PM Press. 2010. http://www.pmpress.org/content/article.php/20100130162821568 (accessed February 2011). Time. “Japan: Honorable Amakasu.” September 5, 1938. The Nation. “The Japanese Massacres.” January 16, 1924: 70-72. The New York Times. “Arrest Tokio Socialists.” July 27, 1919: 25. The New York Times. “Tokio Socialists Aroused.” December 18, 1923: 33. The New York Times. “Third Attempt Made to Kill Gen. Fukuda.” May 25, 1925: 3. The Sydney Morning Herald. “Japanese General Attacked by Socialist.” September 3, 1924. Tsuzuki, Chushichi. “Kotoky, Osugi, and Japanese Anarchism.” Hitotsubashi Journal of Social Sciences, March 1966: 30-42. United Anarchists of Tokyo. “A call from our Japanese comrades .” Kate Sharpley Library. 2003. http://www.katesharpleylibrary.net/2fqzm3 (accessed March 2011). Young, Arthur. Japan in Recent Times, 1912-1926. Greenwod Press, 1973.